How's everybody doing on this fine Friday? Do you know what you are doing this weekend? I'm not sure yet, but I know what I did last weekend. Sure, the very early (and cheesy) plan was to hit up DQ for something green on St. Paddy's day, but then we decided to take things up a notch. You see, we headed to the toy train show up in Wilmington, skipped lunch, and stopped at a neat little place on the way home. 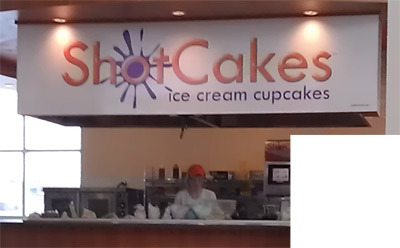 This is ShotCakes : ice cream cupcakes. I will admit that shotcakes will probably make you think shots, but there's no adult beverages here. There's just ice cream and cupcakes, lots and lots of cupcakes! Let's get a close up of all those cupcakes. There are at least 20 varieties here. 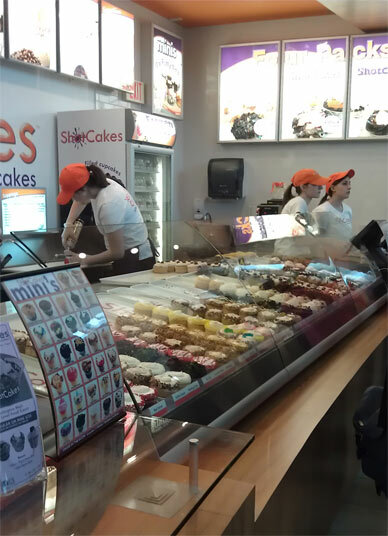 Let me say first that if you just want to buy a cupcake, that's fine by them. Silly me was so focused on the ice cream that I was totally shocked by this fact.... hey, when you are tired and hungry, anything can be shocking. The reality is that it's a very smart decision because not everyone likes ice cream (crazy fools!). 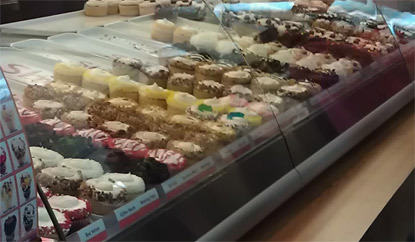 So $2.99 buys you any cupcake you want (buying 4 is a bit cheaper). Wait, I need to stop for my first suggestion: These cupcakes are awesome looking, almost too good because you need a few minutes to pick what you want and that's hard to do if there is a crowd. Maybe if there were paper menus, or maybe if they spread out the display to the other half of the counter, just something so I can ponder and then go back with my order. My daughter wasn't really sure what to do with so many choices, so I pointed out that they have a cotton candy shotcake and she was all for it. I have to give shot-cakes credit because I tried some of the frosting and it does indeed taste like cotton candy. Add in the fact that those colorful sprinkles are a nice visual touch and you should have a real winner for the younger ones in your party. With ice cream, the price is now $3.69. Now being a kid, my daughter went for the ice cream and frosting first, and unfortunately this would be a choice that she would later regret. She was having fun digging in and eating out all the ice cream and some of the frosting. After a bit I asked her how it is and she said the frosting is too much. Wow, this is from the little girl who adores cotton candy ice cream and always asks for more ice cream cake. We wound up scraping off the remaining 35% of the frosting and now she wants her cupcake. She gets about half way through and says she full. Again, I am shocked. She hasn't had a snack since before the train show and I would have expected her to be able to polish off two of these bad boys. Not so today, though reflecting back, maybe a cup of juice would have helped this go down a little easier. As she gave up, she said her cupcake was too sweet. Being me, I grabbed the remaining half cupcake and dug in. I've seen undeserved comments on yelp saying these are like cheap store bought cupcakes, but they are better than that. They aren't the most awesome cupcake ever, but they are a perfectly acceptable vanilla cupcake. I think the sweetness she was tasting was just a lingering cotton candy flavored sugar rush that wore her down. I'm proud of her for knowing when to say when (something I have always stressed). My wife went with the Raspberry Truffle ShotCake and I will admit that it looks excellent... I can only assume it was excellent because she scarfed it down. There is chance I heard some sort of muffled "mmm, so tasty!" Suggestion #2: I don't know why they don't take off the cupcake wrapper for you, or at least ask to take it off for you. It totally effects how you might spoon into this treat. It's not like you can easily remove it after the fact, not until you've spooned off the top anyway. It seems like an unnecessary complication because now you have to worry about accidentally eating the wrapper. Thankfully, my treat was sans wrapper. This is the mighty brownie bite shotcake. 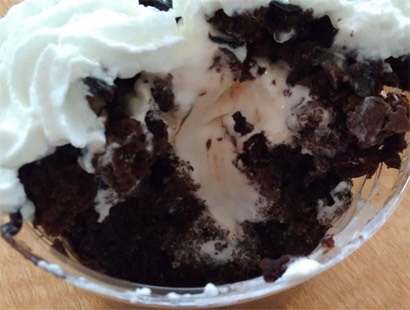 After excusing the amateur whip creaming, you will hopefully notice a chocolate cupcake, brownie bits, fudge sauce, and, well, whip cream. I'm psyched, so let's dig in. 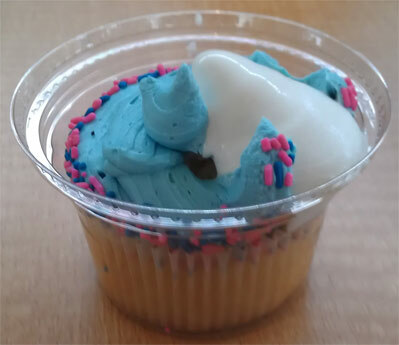 I'm not sure how much sense this picture makes, but the point was to stress that the vanilla soft serve has been injected to the very bottom of the cupcake. Now based on this picture, do you think my treat was good? Well, it was, darn good really. Despite looking kind of small (and considering my stomach was empty), this one cupcake filled me up quite well. It was chocolaty, it was fresh, and I enjoyed it.... quickly. Unfortunately I was too tired to pace myself, and regrettably I did not try the components one by one, but it all made for a fun sundae. Definitely not a bad value at $4.39. 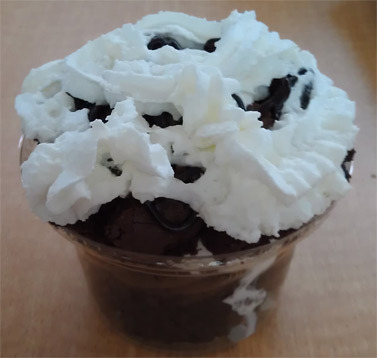 I was pretty happy with my treat, though had they warmed the cupcake (and the brownies) and maybe even thrown a little fudge in the cup first, I would have assumed this to be a near perfect brownie sundae. Oh, it's good, but it's not perfect. It's good enough that I will tell you to try it, but it's not great enough that I will rant endlessly. This is a nice idea and it's got a good location. I totally recommend picking one up before leaving the mall.With just a little further tweaking, I don't see why this can't go national. Suggestion #3: Oh, you may have noticed that all 3 cupcakes were filled with vanilla softserve. Despite being led to believe I would have a choice of vanilla and chocolate (and maybe even strawberry), when it came time to order we had a choice of vanilla soft serve or vanilla frozen yogurt. Well, I didn't come this far for yogurt, and to be honest I was going to go with vanilla anyway, but I'm still disappointed that I don't have a choice. 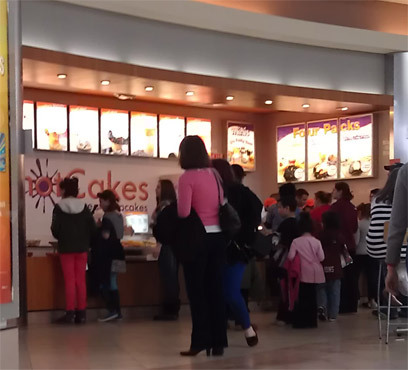 I get them serving up a "healthy" alternative (despite eating something slathered in frosting), and I will even go so far to admit that most people will probably go vanilla on their first visit, but I can see repeat customers being unamused by the lack of injectable choices. 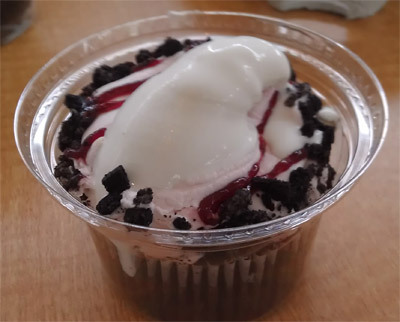 For example, there is a strawberry (shortcake) shotcake on the menu, but how much more awesome would it be with actual strawberry soft serve inside. Yes, vanilla is the standard and most likely to be accepted, but I can see it hurting repeat business (maybe it was an off day). Ok, enough about shotcakes, cupcakes and ice cream. You get my point, and the point is, if you find yourself rolling down 128, stop at the Burlington Mall and give these guys a try. They also have shakes and smoothies and all that stuff. With a better website (suggestion #4) and some good luck, maybe they'll find get to their dreams of expanding -- and if they need someone to blog about their latest grand opening, I'm available. So you had me curious enough to see how far they are away from me. Now if it was around 2 hours I'd consider making a sort of adventure out of it but it's almost 4 hours one way. I can see this concept becoming widespread though. I mean come on there are tons of cupcake store out there already so the addition of ice cream couldn't be that hard. The lack of flavor variations for the soft serve is pretty lame though. It's a special "proprietary" machine which is where I'm guessing they want to make their money (though for all I know, other people have them, I didnt check). there's definitely not a lack of cupcake flavors at least! Really fun post! They all look good to me. Hope your little ones liked the toy train show. Thanks! My daughter wasn't a huge fan (too crowded) but baby boy had fun, though for some reason he didn't like the tiny (N-gauge) trains.